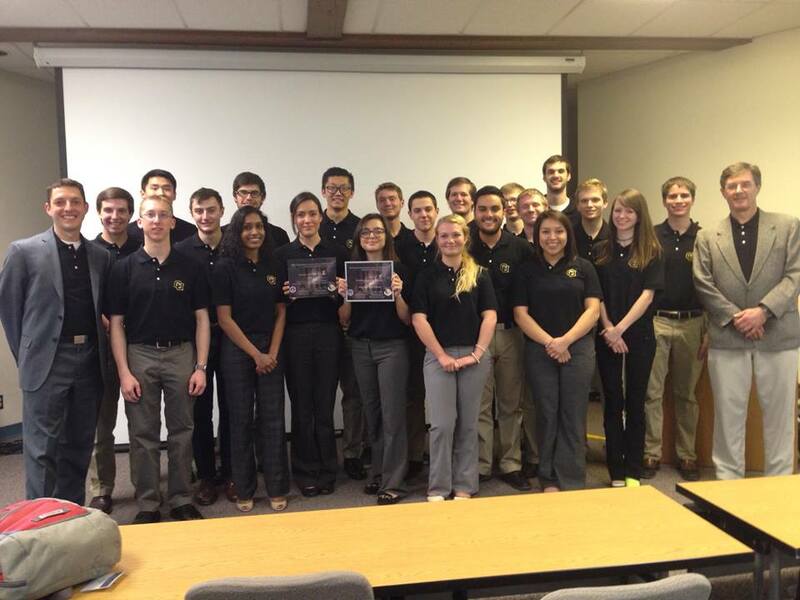 February 2, 2015 – A team of students from the University of Colorado at Boulder (CU) have won the opportunity to launch a satellite they designed and built into space. CU placed second among 10 universities competing in the University Nanosat Program in Albuquerque, New Mexico last week. The University Nanosat Program was established in 1999 by Air Force Research Laboratory (AFRL) and the Air Force Office of Scientific Research as a way to inspire and train the next generation of space professionals. It is a rigorous two-year concept-to-flight-ready spacecraft competition, and the only program in the country that gives university students the opportunity to actually participate in U.S. spacecraft development. Now in its eighth cycle, this is the first time multiple winners were selected. Boston University and State University of New York at Buffalo tied for 5th place. Judges will break the tie during upcoming visits to both universities, where they will conduct a deep dive into their respective programs. Each winning school will receive $110,000 from the Air Force Office of Science and Technology, and mission support from AFRL/Space Vehicles to finish preparing their satellites for launch. The PolarCube team at the University of Colorado at Boulder is comprised of experts in radiometer design and testing, snow and ice data analysis, and a student team with CubeSat build experience for a 1U and 3U CubeSats. The project involves a highly interdisciplinary team of graduate and undergraduate students with responsibility for the development, test, integration and delivery of the complete satellite. PolarCube will be one of the first 3U CubeSats capable of remote sensing from a low Earth orbit platform. An on-board radiometer instrument using the 118.7503 GHz diatomic oxygen resonance will provide measurements of thermal atmosphere emissions within the troposphere (0-30 km). These measurements will extend understanding of the processes that govern estimated weather, global water, and energy fluxes (temperature, moisture, precipitation, cloud water and ice). Nearly 30 universities applied to participate in this round of the program and the ten finalists were selected two years ago. In addition to the winners listed above, Embry Riddle Aeronautical University, University of California Los Angeles, University of Florida and New Mexico State University also competed as finalists. Missouri University of Science & Technology, M-SAT (SSA/Prox Ops) – Determine physical characteristics of an Uncooperative Residential Space Object (URSO) by utilizing visible light and infrared images. Estimate and track the trajectory of an URSO. Perform visual-based proximity operations to characterize the physical structure of an URSO. Georgia Institute of Technology, RECONSO (Defensive Space/Prox Ops) – RECONSO’s mission is to place a passive optical sensor in a Low Earth Orbit. This sensor will be used to detect and track transient objects within its field of view. The detected objects will be analyzed to generate track information from the optical observations made to help study space debris. Boston University, ANDESITE (Space Weather Effects) – ANDESITE will evaluate a space based – wireless sensor network to examine the spatial and temporal variability of the current density within the region 1 and region 2Birkeland currents through in situ magnetic field measurements. State University of New York at Buffalo, GLADOS (SSA) – Utilize multi-band photometric data of glinting space objects to identify their type, surface materials, and orientation. Approximately 5,000 students from 32 universities have participated in the program since its inception and several of their satellites have been sent to space.